In the past week you may have heard people start to talk about something called Ello. Though it sounds like a cockney-accented greeting, it's actually a new social network with one major selling point: It doesn't have any ads. Ello is setting itself up to be the anti-Facebook, and apparently people are flooding it—it's at least getting a lot of buzz. It's certainly not the first alternative social network, and while it could just be a fleeting trend, it's getting a buttload of attention. So what's all the fuss over? It takes some getting used to. The thing is, if you're trying to be the anti-Facebook, it means you have to be different than Facebook. So Ello has to buck that straightforward kind of navigation, which means it sacrifices some of the intuitiveness of the whole experience. But the look is insanely simple! You can organize your pals into two lists: friends and noise. That's somewhat of a riff off Google+'s Circles, but much simpler. Your feed is fluid. You navigate by scrolling down, kind of like Twitter on the web without the character limit or promoted messages clogging up your pipeline. 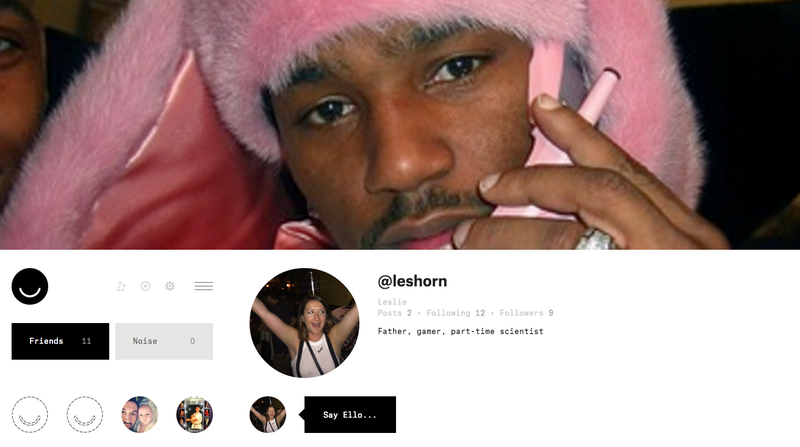 You can post short messages, add photos, and @ reply your fellow Ello-ers. You can add links and whatnot, but no embeds (yet, presumably), however Ello does boast in-line emoji integration. *Fist bump emoji. * It also has GIF support right out the gate. This is what a friend's profile looks like. See how you can add them to either friends or noise? For the record, search isn't working at all for me and most of my friends who are using Ello. It's pretty annoying to figure out. I had to type my friends' usernames into the URL manually (ello.co/username) to find them. Anyhoo, profile looks not unlike a very pared down Twitter profile, with a big banner pic up top, your avatar below with your user name, posts, and followers, and your friends' avatars on the left. Beyond that, there really isn't much to explain, because if you've tooled around with Twitter or Facebook you can figure this out easily. The emphasis is really on design and simplicity. That's cool and all, but not if it gets in the way of making something that's easy to use. Ello's manifesto is, of course, about maintaining an ad desert. Nothing will appear on the site offering you weight loss supplements or a new credit card with no fee. So how does Ello keep the lights on? In the about section titled WTF, Ello's people explain that soon they'll be offering "special features" that people can pay for if they'd like to add them to their account. So think of it as a freemium social network. But Ello also emphasizes that unlike social networks that started ad-free and eventually become ad-full, they will never, ever serve up ads. The verdict is still out as to Ello's merits as a social network you'd actually want to use—I just joined this morning and have only played around on it a little bit. Moreover, all my Ello friends are my fellow Gizmodo staffers and media people. Great! Fine! That's sort of how Twitter caught on. And so far it's mirroring the launches of alt social-ish networks like Branch or Potluck. First the buzz, then a rush to join, followed by inevitable abandonment of said new site. We've seen this happen dozens of times. Which means, Ello might end up being a niche community for artists or the privacy paranoid, if that. But ultimately it just serves another purpose entirely, because face it: all billion of your friends are on Facebook, and they aren't going anywhere.